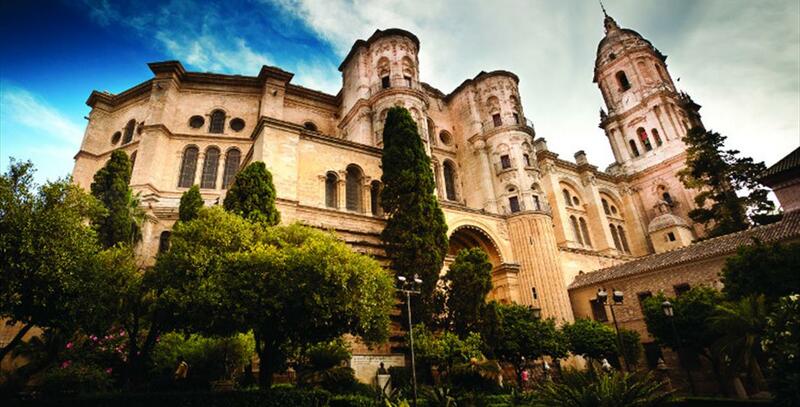 Malaga Cathedral is an example of the Spanish Renaissance and Baroque style, present in both the main facade and the interior. Located in Malaga"s old town, the building can be seen from the rest of the city. It was erected in the first half of the sixteenth century on the former mosque, and its construction lasted until well into the eighteenth century. In the end, it remained unfinished, notably lacking one of its towers, which is why locals nicknamed it "la Manquita" (the one-armed lady). It consists of a basilica floorplan, three naves of the same height topped by a polygonal apse with an ambulatory. In its interior, you can see works by masters such as Diego de Siloé and Diego de Vergara. The most important work is its impressive Baroque choir, which was completed by artists of the stature of Pedro de Mena, Ortiz de Vargas and Giuseppe Micael Alfaro. The Cathedral"s Sillería del Coro (choir stalls), from the seventeenth century, has been declared to be a Work of Cultural Interest. Currently you can visit the Cathedral rooftops, for which advance reservation is necessary.